One of Airship’s most powerful tools is the ability to segment your audience with tags. Providing users with a set of notification preferences is a great way of creating these segments. Airship provides an additional framework that allows you to easily create and style a Preference Center. Download and installation instructions can be found here. Preference Center supports iOS 8 and above. Preference Center is designed to take an array of preference tags and display them with a switch to toggle each preference on or off. Remember to use a tag group that has already been created or else Preference Center will not display. 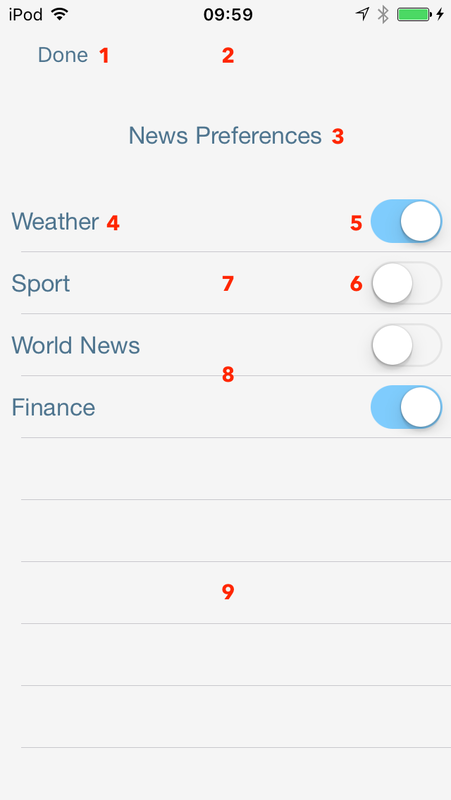 This will display the Preference Center with "News Preferences" as a title, along with default font and color styles. A default UATagPreferenceCenterStyle.plist file is included and can be overwritten with custom styles. The Preference Center can easily be displayed modally with UATagPreferences.start, however, you may want to integrate this deeper into your app. You can do this by initializing UATagPreferencesViewController directly or by subclassing it. UATagPreferencesViewController requires an array of UATagPreference objects in order to display any data. Populate this property with your tag preferences before the view is shown, along with optional style and title properties. A title should be used to identify the Preference Center. If an empty string is found when displaying the Preference Center modally, it will default to display "Notification Preferences" as the title. "alert": "Pick your favorite news preferences!" You can update all or part of the Preference Center with the same key/value pairs as mentioned above. The only difference is the action key used: ua_tag_preference_save_action. It is recommended that you update through content-available silent pushes to avoid alerting the users unnecessarily.